Rithvik Dhanjani (the host) speaks of having emotional and sometimes sensational love stories in Yeh Hai Aashiqui Season 1. He speaks of feelings, new expectations, craziness are also prevalent in love and thus it is Siyappa for Season 2. He further adds on how you try to run away from commitment to realize that you are actually in love. Today’s story is about two college students – Nick and Krish, and is set in Chandigarh. At Krish’s (Krishika) home, her cousins are planning a weekend at a bungalow (farmhouse) and their aunt – Krish’s mom wants them to take Krish as well. They meet Krish and tries to convince her dearly for coming at the farmhouse. Finally, Krish agrees to their request and then asks her mom why she planned such a trip. She is told to go with a friend Gippy but she replies of having a boyfriend and leaves. Later, at her college, Nick at the canteen meets Krish and asks her to write a write-up. He even begs her and holds her knees and can do anything what she wants. She asks him for a deal, how about acting as her BF, and in return she will write the write-up for him. She asks him to come on her bike and she wants to drive herself. He speaks of his reputation at college but she doesn’t entertain him. Both leave on the bike for farmhouse. On the way, he speaks of having passion for photography, which he has since childhood. He also speaks of not having good bikes and asks her what will they be doing at the weekend there. Soon, both reaches the bungalow and he asks her who lives there. He then learns that she was listening music all during the journey. She asks him to behave like her BF and he wonders how he is going to act. She replies he acts like dude in college. He boasts himself that it is impossible to stay away from him and also suggests his acting has much strength that she will find hard to stay away from him., He wishes her good luck and enter the farmhouse together and meets her cousins. The cousins ask since how long they are dating and both replies different answers. Nick convinces the cousins that he is dating with Krish from 1 month. Both are given a room to share for the weekend. He speaks to her cousin of managing the room. She informs him of not able to share the room with him. He asks her to sleep on the couch while he will sleep on the bed. She shouts at him with his careless attitude. Soon, he receives the call from his friend and he opens-up on acting as Krish’s BF there infront of the cousins. He also informs his friends that he is just concerned on the write-up and nothing else. Later, in the night there is a truth and dare game. He chooses truth since he wants to do things by heart and suggests dare means they will ask him to kiss krish. The cousins ask him to open-up about his love story – where they met, how it happen and what did they do. He speaks of meeting Krish on the first day of college and stops. He then speaks of playing basketball with friends and found someone fighting with the watchman. He was just watching her and he asks Krish whether they met there. Krish agrees with him and suggests he sat on her bike. The cousins wonder how come Nick sat on their elder sister’s bike. Nick gets lost in thoughts and couldn’t know the next sentence. Krish and Nick boast about their friendship to her cousins. Krish speaks of going on a long drive but with no destination and both didn’t talk to each other. Krish’s cousins wants to know more about her romantic journey while Khwabon Ka Jharokha song (Ankahee from Lootera movie) plays in background. Nick gets mesmerized with Krish’s story and calls it amazing. Krish replies it is a story for others but for them it is their first date. Later, Nick speaks of becoming a fan to Krish. She speaks of not being romantic and since she is a writer so cooked a story easily. He suggests they will become friends soon. But she doesn’t want to become friends. He speaks of life being boring without friends and suggests she didn’t have a good friend until now. She gets upset with him and informs him nothing can happen between them and gets hyper. Nick replies that she will remain lonely without friends and gets angry and goes ahead sleep. Next morning, Nick takes photographs of Krish’s cousins and other friends and finds Krish to be quite in one corner. He apologizes to her earnestly for his angry behavior and shows her a video which became a laughing stock. In the video, a girl is made fun of by her friends as she wore vampire dress at a party and many people have laughed at it including himself. He calls it as funny video. She replies that the girl in the video is herself and nobody understood her plight. She had went to the party in vampire costume thinking of the haloween party as told by her friend. But infact she was made fun by her friend who even spread the video online to bully her. She suggests to Nick that if your friend does such an act then friendship and things doesn’t matter anymore. He begins to shoot Krish with his phone and records a video and suggests that her friend didn’t know the right meaning of friendship. He suggests not everyone will behave in that way and asks her to trust others by giving another chance. He asks her to show trust on him and she has to move on. He asks her to give million dollar smile while she carries nervousness. Soon, she starts smiling and gets comfortable with him. [Raabta song plays]. Both spend more time together lying on the lawn and have good time. Later, Krish participates in hide and seek game alongwith her cousins and reminds them of playing it 10 years ago. Nick comes to hide alongside her and she pushes him away but he sticks around her. She accidentally puts her hand on his mouth, which makes him have an eyelock and soon both looks at each other. They inch closer to kiss but stops as the cousins call them. Next morning, he calls himself as her hero and she asks him to drive the bike as they are about to leave from the farmhouse. She didn’t listen to him as he wanted her to drive [Naina…song from Khoobsurat plays]. He drops her to her home and she thanks him for their weekend outing. As he was leaving she stops him and showers a kiss on his cheek. At home, she reminisces moments she shared with Nick at the farmhouse during weekend and smiles thinking about him. Later, at Krish’s college, some boys make taunt and hurl abuses at her asking her to take them once for some weekends as well. Additionally, some girls make taunt at her, which brings tears to her eyes. She runs outside the college and bumps into Nick who wonders what happened to her. Krish meets some boys and one of the boys suggests to Nick that he has spent the weekend with krish lavishly and have much fun. 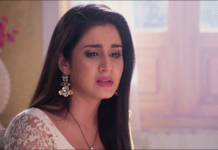 Nick pushes his colleague away and runs from there while Krish cries at her home and recollects Nick’s words asking her to trust him since he will never break her trust. She also recollects the taunts and abuses she got at the college and gets more teary eyed. Later, Nick comes to Krish’s home and finds her locked inside her room and not willing to open the room [preet song plays]. He enters her room and speaks of just speaking lightly other day to his friends about his trip of going with her for the weekend. He clarifies on not intending to hurt her in anyways whatsoever. He asks her to open the door otherwise he will break the glass. After that warning, he breaks the glass and marks his entry and gets teary eyed. He asks her to trust him since not everyone is going to break trust. He begins to talk about long bike ride, sunset where there only both of them will be present and will look for a new destination. He further adds of no silence but lots of talk and also signals from eyes. He asks whether she will come with him. She nods her head while getting teary eyed. He introduces himself as Nick and holds her cheeks and confesses his love – I love your Krish message. She replies I love you Nick. Both shower warm hug and becomes lovestruck. The story ends on that happy note. Rithvik just before signing off speaks of love can happen between most unexpected people and asks people to give love a chance. * Krish is portrayed by actress Annie Gill. – Annie Gill was born in Firozpur, Punjab, India. She first made an entry on Indian Television by participating as a game partner of Rahul Bose in Color’s reality show – Khatron ke Khiladi Season 3. – She also took part in another reality show Zor Ka Jhatka: Total Wipeout (NDTV Imagine). Her major role is of Rano in Sony’s show – Anamika [show ended in September 2013]. Read more at her Wikipedia page. – Annie worked in the first episode (31st May 2014) of Bindass’ Love by Chance and played the role of Roshni and also in Yeh Hai Aashiqui Episode 60 aired on 22nd August’14. * Nick is portrayed by actor Jitendra Nokewal.